BERLIN, 1931: Sisters raised in a Catholic orphanage, Berni and Grete Metzger are each other’s whole world. That is, until life propels them to opposite sides of seedy, splendid, and violent Weimar Berlin. Berni becomes a cigarette girl, a denizen of the cabaret scene alongside her transgender best friend Anita, who is considering a risky gender reassignment surgery. Meanwhile Grete is hired as a maid to a Nazi family, and begins to form a complicated bond with their son whilst training as a nurse. As Germany barrels toward the Third Reich and ruin, both sisters eventually come to the same conclusion: they have to leave the country. And they will leave together. But nothing goes as planned as the sisters each make decisions that will change their lives, and their relationship, forever. 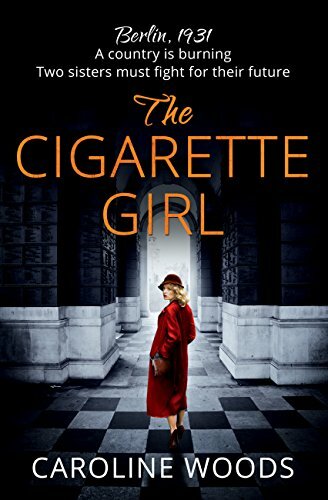 The Cigarette Girl by Caroline Woods revolves around the stories of two orphaned sisters who are in a West Berlin orphanage and it starts in 1923. Berni and Grete are the sisters and the book looks at their lives over time from one or the other’s perspective up until the late 1930s. There is also a strand of the story which is obviously connected in some way set in America in the 1970s. Over this time the two girls lives take very different paths and have consequences for both of them. I found the writing in this book highly evocative right from the start. Berlin with hyperinflation and life in the Catholic orphanage is well painted. If anything the images of their later lives in Berlin are even more vivid. Berni is a “cigarette girl” in a bar – not at all respectable – while Grete is a servant. I found myself completely caught up in their lives. The characters in this story are rich. They feel like real people in a real setting and they get to you. Not the most major character but important, Anita’s story seemed particularly powerful and poignant at times as an example. She is actually a man who dresses as a woman. Perfectly acceptable (in the right places at least) at the start of this story. Very unacceptable and dangerous as time goes by.